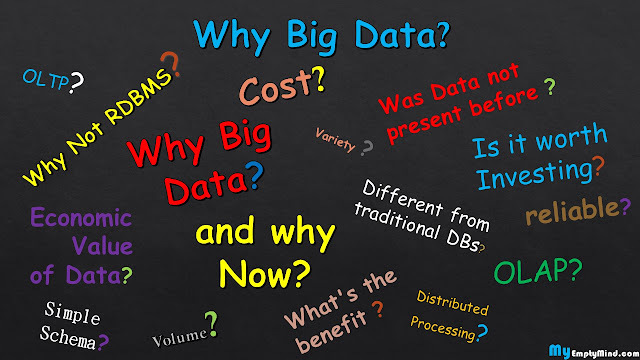 Why Big Data when we already have well tested and reliable traditional RDBMS solution? Big Data Analytics had become a buzzword today. Be it Insurance, Banking, Ecommerce or anything everyone is inclined towards learning or implementing Big Data. Analytics basically is the quantification of the insight developed for the small phenomenon happening in the real life through proper massage of huge amount of data based on complex and cumbersome algorithm. Data is a magic wand or the tool which can conjure perfect strategy to venture on by identifying the pattern and relationship present inside it. Business is all about taking right decision and more importantly at the right time. The Quantification of the Insights derived from the data by identifying the pattern and relationship can prove to be reliable in solving problems and taking decisions. Companies now-a-days are selling the insights to the vendors who actually need the information to drive their marketing strategy or to reach out to more and more targeted audience. Why Big Data when we already have the well tested and reliable traditional RDBMS solution? Why didn’t we have to deal with Big Data 5-10 years back, from where the data came all of a sudden? Didn’t we have eCommerce website selling products online and generating huge amount data 10 years back for what good they are migrating to Big Data? Why didn’t we have to deal with Big Data 5-10 years back? Lack of easy, cost effective and faster processing engine to analysis terabytes of data of different variety. We had the solution like Netezza, Teradata etc but they are very costly and are difficult to scale up. Since the advent of globalization the amount of data being generated has increased tremendously which will keep on growing with a tremendous speed. The world has really producing data with an accelerating rate every year. The reason behind this surge is the growth in globalization. Data is doubling every two year and Stat from EMC on the expected growth of Data from 4.4 zettabytes in 2013 to 44 zettabytes in 2020. Type and Amount of data. Rationality of the algorithm applied. So the more data you process the more precise your insights will be and Hadoop came as a cost effective fault tolerant processing solution in which industry can invest to achieve a through put where the investment is far less than the economic value of insights that they can get by processing and analyzing the data.